WESG, despite all its flaws, is a great way for players who aren't that well known yet to get their name out there and make a bit of cash to support themselves. During this years finals, ShiaoPi had the opportunity to sit down with one of those players, Mathis "Jabbz" Friesel from Team Deutschlando. Here's what he had to say. LiquidDota.com: Thank you very much for giving us this interview. Since the majority of our community are probably not familiar with you and your team, please introduce yourself and your teammates a bit. Jabbz: My name is Mathis Friesel, I am known as Jabbz. The team got formed when we decided more or less minutes before the qualifiers that we do in fact want to compete. The day prior HoviteY and Stormstormer asked me whether or not I want to play. And then I thought, yeah I actually want to play. Even though I have not really played Dota for about 2 months. Then Blazemon joined and 5 minutes before the qualifier we needed another player so Scabo stepped in. 5 minutes are obviously exaggerated but everything was very last-minute. It was a bit chaotic but we just played the qualifiers. It was just after a new patch got released and we cheesed our way through, so now we are here. "We thought we knew how to play since we did not lose any scrim"
LD.com: WESG with its focus on nationalities is a rather uncommon format for Dota 2. How do you like it? Jabbz: I actually find it extremely interesting. The only problem is that in Dota 2, compared to say CS:GO, the best players don’t attend. That is related to the fact that in Dota 2 not many teams are from a single country. Mostly they are European teams that are mixed. The exceptions to that are usually the Chinese or Russian teams, who subsequently take the top spots. It would be really cool if players like for example KuroKy compete at WESG. But two years in a row KuroKy qualified for the global finals and then just did not attend the LAN main event. Maybe because he was busy or it was not worth it or maybe he did not feel like it, who knows. I’ve been to WESG every year and multiple years in a row I tried to motivate players like qojqva, Black^ and KheZu. They always said they’d like to play but then it just does not work out. For example this year, qojqva really wanted to play, but then a DPC event got scheduled at the same time and he did not know whether or not Alliance would be there, so he cancelled. WESG is a cool idea but unfortunately it does not have high priority in the Dota 2 scene. LD.com: I wanted to ask a bit more about the German Dota 2 scene. The German scene was famous for strong stacks in the past, for example Team PANZER comes to mind. In recent years that has subsided quite a bit. Obviously you still have strong players, who are individually playing in tier 1 teams, like Fata- or KuroKy, but as fan and spectator it feels like the German scene has gotten weaker. Would you agree on that statement and if yes what do you think would be the reasons for it? Jabbz: I would not say that the German scene got weaker. I would almost even say that it got stronger if you only consider the skill. But the entire Dota 2 world has improved a lot so maybe in comparison to all it feels that way. Back then you had stacks that played together like PANZER, but they also played joindota-tournaments and were present in the tier 2 scene. 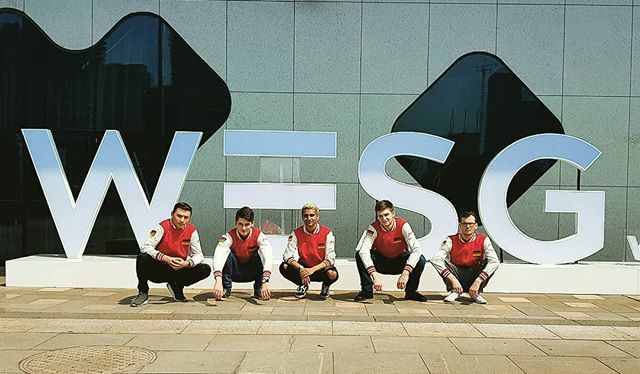 Nowadays you can have a German stack but the only thing they win would be a DOTA-LAN (Translator’s Note: The biggest German Dota2-LAN tournament) and not a WESG. Last year we had a better prepared team, more time to practice and back then we had a stack of players that in my opinion were almost all relatively successful in different european teams. But this year we really just have what I would call a “DOTA-LAN”-stack. The problem does not lie within the playerbase of the scene, the good players are just too busy or unwilling to play. As I said if KheZu, qojqva and the others would be playing we could achieve a strong placement. But because they are unwilling, it is just us who made it through. Even us making it here was actually quite surprising, since we did not have a dedicated German qualifier this time. We were part of the European qualifier and we still managed to beat one of the actual teams. We played Hippomaniacs in the finals, a team that had also beaten Secret at qualifiers then, but somehow we beat them. I don’t really know, it was a bit like power of friendship or something, it just worked out. But I do think though that we played better in the qualifiers than we did here at the main event. That was also owed to the fact that we did not really have good scrimming partners before we flew to China and were simply unready for the level of competition here. We played against Russian stacks and so on, but not against actual teams. So when we arrived and scrimmed teams like The Final Tribe and Team Team for the first time, we realized that we actually don’t know how to play. We have just played things that should not work out until now. LD.com: A bit like playing pub-strats? Jabbz: Yeah, exactly. It worked before and then it did not anymore once we got here. It came out of left-field. LD.com: You have now already elaborated a bit on why Germany got eliminated in the group stage. Was the missing preparation the main reason or were there also other reasons? Jabbz: Not necessarily missing preparation, more like wrong preparation. It was a bit of an illusion, we thought we knew how to play since we did not lose any scrim. For a week we played 3 to 4 games per day and lost only once or maybe 2 times. We thought we understood how to play but that was just wrong. Against actual teams our strategies simply did not work. The other issue was that players like Blazemon, Scabo and myself admittedly have stopped playing Dota almost entirely. Stormstormer is more or less the only person who still plays properly. He solo-queues every day and has recently still played in a team, he played with syndereN and Happy Guys. But players like Blazemon and myself, we did play in PENTA and I played the TI qualifiers with Kingdra but since then almost nothing. Maybe occasionally or party games but we have placed Dota 2 firmly behind real life commitments like University etc.. So we are more like a stack that somehow made it through instead of one that actually represents the German Dota scene. Personally I had high expectations last year but this time around I would have already been very glad to make it out of groups. But if it did not happen it simply was not meant to be. "So we played a year without finding a organisation, no prize money and I made 0€ for an entire year. I then decided to stop after TI8 qualifiers." LD.com: Now for a question regarding your personal career. You have already said you are focusing more on university and real life, but can you see yourself maybe trying to go pro again at a later date or have you closed that chapter already more or less for you? Jabbz: I would say it is already closed for me, but you never know. You really want to reach that goal of tier 1 one day. 3 years ago I already wanted to go to university but after 1 semester I thought to myself that I have to give Dota 2 a chance. So I interrupted my studies, went full-time Dota 2 and founded the team that would become PENTA. And we got really good in that season, winning tournaments and from the no-name players we were back then we all became fairly well known. After PENTA, after the TI qualifiers we decided as a team for me to leave that roster. Afterwards I once more faced the question whether I should either resume my studies or not. This time I thought to myself, now that I have the experience and the contacts I’ll try it another year. Over that year it was the season when teams like Secret and OG were playing in qualifiers. LD.com: The first DPC season? Jabbz: Yes, the first season. It was supposed to be better for newer teams but the problem was just that we had to play Secret or later OG in each and every qualifier. And they simply won every final. We had no LANs and no online tournaments since they did not exist anymore. So we played a year without finding a organisation, no prize money and I made 0€ for an entire year. I then decided to stop after TI8 qualifiers. Even before the qualifiers we already kind of knew it was not going to work. We did not really have good team chemistry. Then the qualifier came around and it was more or less a complete disaster. We lost almost all games in the group and we knew it was over. And afterwards I decided to go back to university. LD.com: But unfortunately that was not enough. LD.com: Is this your first time in Chongqing or were you here before? Jabbz: It is my first time in Chongqing but I have been to China before. Like last year for WESG I had been to Changsha, Guangzhou and then Haikou for the event. But besides that I have not been to China. LD.com: Did you already try the local spicy food? Jabbz: Yeah, haha, the food here is something. Even the food that is supposedly not spicy is still spicy, I can really feel it. But I am also a person that does not handle spicy food well. So every meal I really notice that everything is hot. But what I haven’t tried yet is the famous Ma-La Hot Pot, I don’t really dare to to be honest, since if the other things are already spicy I really need to watch out for that. LD.com: Very true, thank you very much for this interview. Good one, highlighting the struggles so many t2 players have!